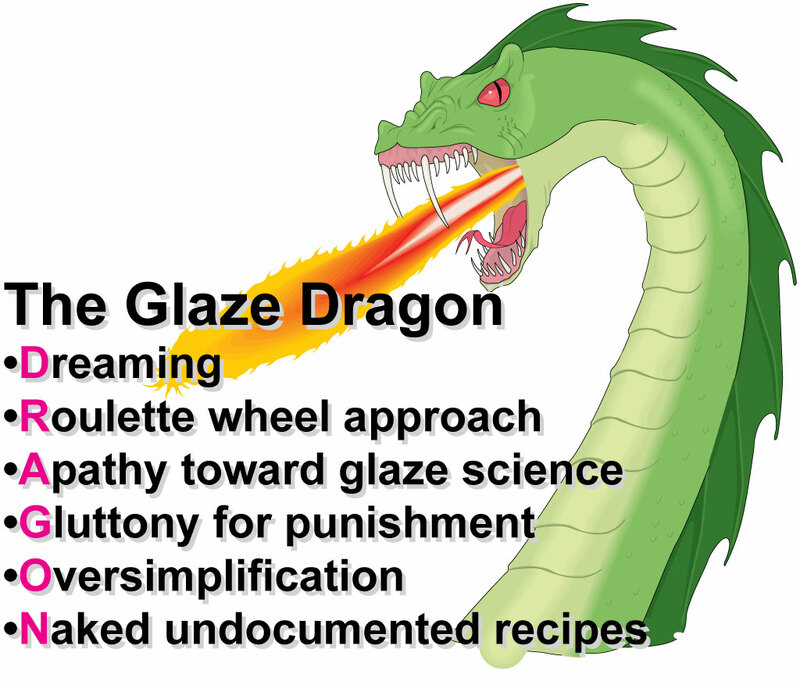 I love to use the Glaze Dragon as a symbol of the attitudes that prevent us from getting control of our glazes. It is a good analogy for the prevailing 'glaze recipe culture' and our addiction to the 'roulette wheel' approach to finding glazes. 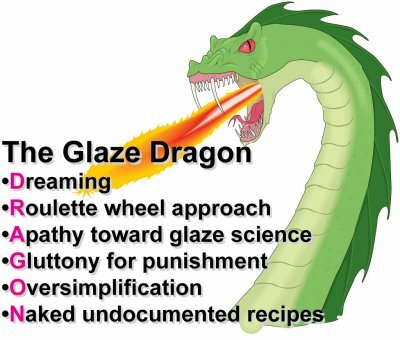 The dragon wants us to think glaze science is a 'mystery', that existing recipes were dropped from heaven and questioning or adjusting them is blasphemy. The advent of the internet has actually made us worse, we're furiously trafficking in more recipes that don't travel well. Decades of glossy magazines have taught us that 'appearance is everything'. Schools still crank out generations of ceramists with numbed consciences regarding their functional accountability to customers. At conferences we've argued about craft and art and addressed the politics of ceramics. But the closest we ever seem to come to understanding glazes is learning application methods. It is true, many authors and teachers have been singing the 'learn-your-materials' song. But those studying materials feel ill-equipped to create balanced, fitted, strong, color compatible glazes, opening the kiln is still like pulling the handle on a slot machine. The key to creating good recipes is the marriage of material and oxide knowledge. Oxides? Fired glazes are built out of them. They are a universal language of glazes. The kiln decomposes ceramic materials into their oxide building blocks and reassembles them into the fired glaze. Oxide know-how has been out there all along and computer users have rediscovered it. These people have not been on the roller coaster, they have been making really exciting things happen in the studio and on the factory floor, learning from their mistakes as never before. And the Internet has allowed them to find each other and rejoice in not being as alone as they thought. But many questions still remain. The most asked question I hear is: "Do you have a good cone 6 glaze?" It is asked so often because so many non-satisfactory answers have been given in the past. What we need to answer it well is a 'attitude transplant' about what a good glaze is and how to get it. I would like to demonstrate how we can view materials as both powders with a physical presence that shapes the properties of the glaze slurry and also as 'oxide warehouses' that supply building blocks to the fired glass. Reliable, stable, and predictable. Its chemistry is balanced so that firing it a little slower or faster, lower or higher, applied thicker or thinner makes minimal difference and still is predictable. It offers the true economy of quality materials. It works with a variety of stains and has associated documentation about what colors it does not work with, why, and what to do about it. It has maximum resistance to leaching so you don't poison your customers. It applies evenly without drips or cracking even on very dense bisque ware and fires without a tendency to blister or crawl. It does not settle hard in the bucket and it does not gel or powder off excessively. It fires to a hard and durable surface. It does not pinhole, crawl, or blister. Poor glaze fit dramatically weakens ceramic ware. Thus it would have a relatively low thermal expansion so it not only does not craze on the intended body(s) but fits well so it strengthens ware. It offers good transparency not only for its own use but as a clean starting point for other glazes. It employs easy-to-get materials whose chemistry is published by the manufacturer or distributor(s). You can easily adjust its melting temperature, expansion, gloss, etc. How many textbook glazes have you found that could withstand this scrutiny? I've had ones that looked good but satisfied almost none of these requirements! Remember a fundamental point: The key to creating good recipes is the marriage of material and oxide knowledge. It would be very difficult indeed to meet the above requirements using a material-blending approach. It would be impossible to chance upon them by mixing recipes! It is imperative to look at the fired glaze as a formula. What is a formula? A formula compares the numbers of oxide molecules in the fired glaze. Oxides tend to have predictable effects. You might respond: "That's too much trouble, it is all a matter of faith and trust anyway, just give me the glaze recipe!" But the Potter's Prayer is not enough, ethics and accountability are involved. Other's materials are different than mine, as is their clay, process, firing, taste, and type of ware. Someone's poor implementation or misapplication of my recipe could produce weak, difficult-to-clean, crazed, shivered, leached ware that hurts the reputation of the ceramic community, could injure people physically, and makes me partly accountable for the technical quality of their ware! Ethically I should understand and document a recipe before handing it out to prove that I am conscientious and willing to field questions to help users adapt. Borrowing recipes from others without being willing to adjust or question them is looking more and more like taking someone else's prescription. Let's try to create and test glaze recipe that addresses the above requirements. I'll leave the trial and error additions of colorants, opacifiers, specking agents and variegators to you. First, consider this limit chart for cone 6 non-leaded stoneware glazes. This chart is not a boundary waiting to be proven invalid, it is simply a recommendation of the ceramic industry. Formulas within these ranges present the least problems and tend to test well for leaching and hardness. Now lets talk about the oxides in the above limit chart. As we do so don't think about the powdered materials you use to mix up the glaze batch, imagine being able to look at the fired glaze under a microscope powerful enough to reveal the oxide structure. I will consider them in the order they can most easily be supplied from parent materials. Boron is a low melting glass, it is like silica on steroids, it is a flux and a glass. It is possible to make a cone 6 glaze without boron but it won't flow nearly as well and it will tend craze. Lots of cone 6 glazes have way too much boron, some employing Gerstley Borate to supply as much B2O3 as all the other fluxes combined. Not good, it should be one third of that. Why? Durability, solubility and reversal of the thermal expansion influence. Like steroids, use it when appropriate and in the right amounts only! I get very good melt fluidity when B2O3 comprises about 25% of the fluxes. However chrome-tin colors tend to start failing if the boron is more than one third of the CaO amount, more on this later. A no-alumina boron frit is perfect to source B2O3 because we can supply lots of alumina from kaolin, giving the glaze good slurry properties. About 25% Frit 3134 will give us the needed boron. How do I know that? A ceramic calculation program will show you the makeup of the frit, let you select which oxide to supply and specify how much. It then calculates the amount of frit needed. CaO is a strong flux at cone 10 but not as much so at cone 6. But having some B2O3 around can really encourage CaO to flow better. Likewise the presence of sodium and potassium can turn CaO into a much more active flux (melter). We need CaO as high as possible to make the glaze work with chrome-tin colors, so I would like to approach the maximum recommended in the limit formula. However CaO can really tend to form either calcium-silicate or calcium-borate crystals on cooling if oversupplied. This is a bit of a dilemma. To get around 0.55 formula units of CaO (of a total of 1.0) we need to top up the CaO already supplied by the frit. This will take 10% of my favorite calcium mineral, Wollastonite. It is much better quality than whiting, contains finely dispersed SiO2, and it does not form gases of decomposition. As noted above, these oxides are a good choice to round out the fluxes to a total of 1 (unity formulas are adjusted so the fluxes total 1). Na2O and K2O behave in a similar manner and melt well at cone 6 to encourage bright colors. I chose to use a clean and consistent feldspar named Kona F-4, 15% is needed. The feldspar also brings some alumina and silica with it. An interesting part of supplying this on the computer is that the feldspar also sources CaO so you have to go back and adjust the Wollastonite again to restore CaO to 0.6. Al2O3 gives the glaze melt body, stiffens it to keep it from running off the ware, even over a range of temperatures. The stiff melt also prevents the growth of crystals that disrupt smooth glaze surfaces and cloud transparents, we want that in a base glaze. Alumina lowers glaze thermal expansion very significantly and is a key to glaze hardness and resistance to leaching. Alumina and boron melt together very well. Like SiO2, you want as much alumina as a glaze will take and still melt well (you need good reason to under supply Al2O3 i.e. non-functional crystalline glazes). High Al2O3 usually means a matte glaze, but not if there is significant B2O3 and SiO2 glass formers around. Boron glazes can take a lot of Al2O3, the above chart claims 0.65 parts (compared to around 0.4 for non-boron glazes). Tests I have done show that with the above amount of boron a glaze in this system will comfortably take 0.35 alumina, melt very well and prevent crystal growth. By 'melts well' I mean it has fired hardness, minimal bubble population, smooth hard surface, and good melt flow. Kaolin supplies Al2O3 and it produces a glaze slurry that gels, applies evenly to ware, and dries hard. This is a match made in heaven, the more kaolin a we can employ the better. What kind of kaolin? I prefer EP Kaolin because it is clean, plastic, and flocculates and gels the glaze so it applies without drips, even on dense bisque ware. Like alumina, silica has many beneficial effects on the fired glass. 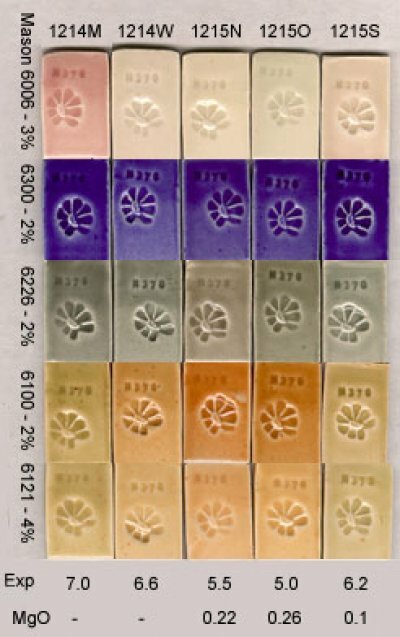 It reduces thermal expansion and increases glaze hardness; the more a glaze can tolerate the better, the limit formula above recommends up to 4.7. It is true that too much will compromise matteness or raise the melting temperature, but it is surprising how many glazes will take plenty of silica without any trouble. For example, I ran many tests with around 2.5 parts SiO2 thinking that it would not melt well with more. Then I added a full 10% silica (the equivalent for going from 2.5 formula to 3.0) and it worked perfectly, completely solving a crazing problem on a low silica porcelain I use. It is possible this recipe will tolerate even more. Classic ceramic calculations that have been around since early this century but we just never bothered. 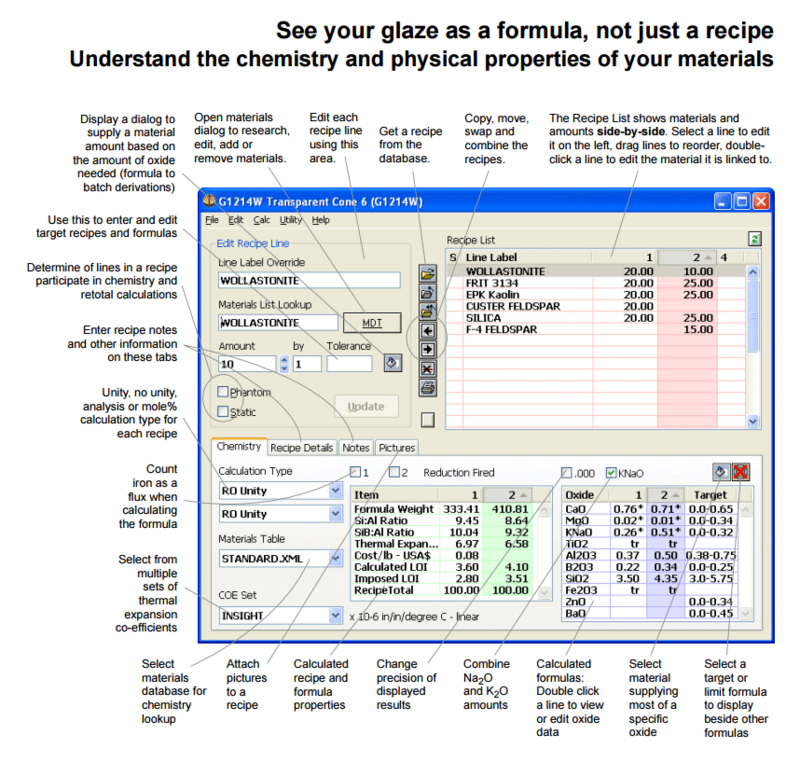 Now glaze chemistry software makes it easy to do them and we are figuring out new ways to apply them. Shown here is an example of the 'business end' of a ceramic calculation computer program. After supplying each of the above oxides from the indicated materials I juggled material amounts to achieve 5% roundoffs. This held all the oxide amounts fairly close to target (except that CaO is a little over the target). Below there is link to this recipe in the recipe area of this site. Add more SiO2 or Al2O3 if it melts well for you, reduce if it does not. Reduce the B2O3 for CaO if you need to use chrome-tin colors. Reduce the SiO2 and increase the CaO to get a matte. Add opacifiers, colorants, variegators, specking agents to create an infinite number of effects. By the way, I found that this recipe worked well with equal parts by weight of water and powder to give a specific gravity of 1.45. Mention the idea of testing a glaze and 99% of us think in terms of dipping a test tile and firing it to see how it looks. But testing should consider far more. You should test slurry properties, application properties, devitrification, clarity, crawling, stain compatibility, leaching, hardness, cutlery marking, crazing/shivering, reaction with solubles, melt flow, firing volatility, and for general functional use. It is true, oxides and formulas can seem intimidating at first. But consider: I can list the oxides on the fingers of my hands and they have predictable behavior. Compare this with thousands of materials whose effects in recipes are much more difficult to predict (there is no such things a 'material limit recipes'). Perhaps you wonder where a person might learn about this 'predictable behavior' of oxides. It does tend to be pretty sparse in textbooks. The oxides area of this site is an excellent place to start. It is possible that you need to move still further to stop crazing on your clay body, especially if it is very low in silica. We suggest increasing B2O3 slightly and then increasing Al2O3. Or you may simply be able to add silica. In serious cases of crazing the magic oxide is MgO, increasing at at the expense of K2O and Na2O will dramatically reduce the expansion. MgO does not melt as well at middle temperature but we have found the diversifying the fluxes and increasing the boron a little will make room for as much MgO as you need. Here is our G1215M recipe. Although the materials in the recipe are quite different, the chemistry is very similar. The small amount of zinc should not be a problem for most, but if it is you can leave it out and see if it still melts enough, if not add a little more frit. You can try increasing the kaolin further to drop expansion. Note that this recipe does not total 100. Because of high MgO this glaze is hostile to the development of color in Chrome Tin pink stains. It thus makes sense to add 1-2 percent zinc to make it work better with oranges and browns. We have tried it with about 20 other Mason stain and it works well with all of them (including manganese alumina pink, lavender and yellows). This formula does not work well with chrome tin pink colors. To make it work you must reduce the boron and increase the calcia until it does. For the brightest pinks you may have to tolerate an increase in thermal expansion and another clay body higher in silica may have to be used to prevent crazing. Since Frit 3134 and equivalents soften very early it is important that as much of the gases of decomposition from the body are expelled as possible before the frit melts and flows too much. If you get pinholing or blistering, try slowing the firing down during the phase just before the frit begins to melt. In this case it is around 1300-1400F. Are You Ready for a Matte Version of this Recipe? Yes, we have a very good matte version that can be tuned to fire with a surface very close to the classic dolomite magnesia mattes of cone 10 reduction (see links). If you feel this was all too complicated, take heart. All of us are in over our heads, the ceramic process is exceptionally complex and none of us are really in control. So we need tools to better understand it. The oxide viewpoint provides a solid framework within which we can grow and learn together, even criticize each other. Yes this framework gives you the opportunity to explain how I am totally wrong about something in the above analysis. Then this base glaze would get even better. So let's at least start the new journey. There are many mindsets that prevent us to getting control of our glazes. Many of them have nothing to do with the glazes themselves, the problem is with us, our culture as ceramists and potters. Insight installs on your Linux, Windows or Mac computer. 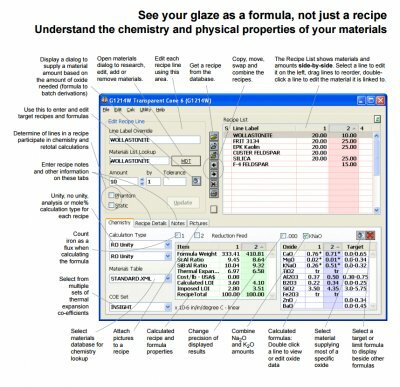 It provides a very interactive way to comparing two recipes and their calculated formulas or analyses. As you make changes in the recipe you can see how it impacts the recipes. It is ideal for demonstrating concepts like unity, analysis, formula, mole%, LOI, formula-to-batch conversion. There is more to glazes than their visual character, they have other physical properties like hardness, thermal expansion, leachability, chemistry and they exhibit many defects. Here are some simple tests.